Helen Hamilton is a girl living on Nantucket Island who discovers she's a Scion, a descendant of a Greek god, and Helen of Troy. She has a mission: descend to Hades and pacify the Furies. She also wants to stop the war between gods and Scions. Helen is in love with Lucas Delios (Paris), even though she can't because they're first cousins and members of different houses. So they need to stay apart. Lucas pretends he hates Helen. Helen meets another Scion, Orion. He has the ability to go to Hades with her in order to help her. Soon they form a bond, and Lucas is jealous. But there's someone watching Helen, someone who threatens her. 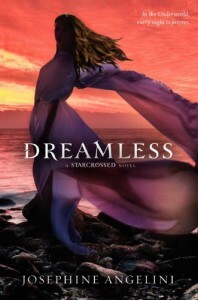 Dreamless starts a couple of weeks after Starcrossed ended. Helen is still going to Hades in her sleep. This is exhausting her more than ever, but she's determined not to give up. 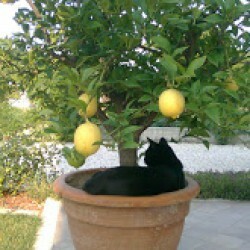 She needs to find a way to neutralize the Furies and end the war between the houses. Helen and Lucas think they can't be together because they're first cousins. This doesn't really make much sense, but there you go. Enter a new love interest for Helen in the form of Orion, from the houses of Rome and Thebes (I don't really get the names of the houses, either. Rome, Thebes, and Athens are names of cities, but Atreus isn't. Why not the house of Sparta?). They get along, and Lucas is led to believe the two are sleeping together. This makes him very jealous, but he's determined to stay out of it. Together, Helen and Orion find away to bring peace to the Furies. This was a good book, all in all. The drama is not too much. The love triangle really wouldn't be necessary, but what would a young adult book be without one?